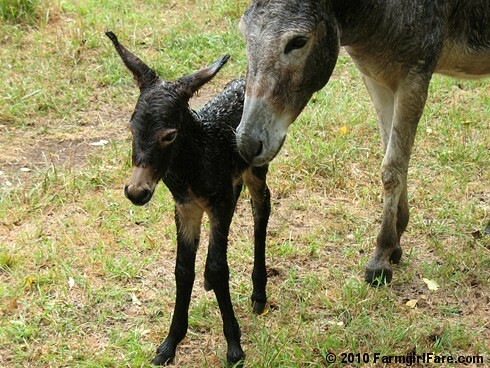 A big congratulations to young Esmeralda, who gave birth to this adorable itty bitty boy this morning! 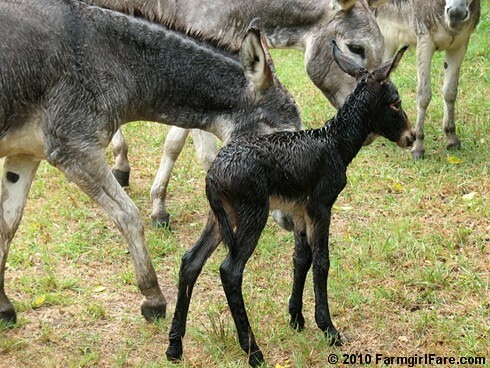 (You can get to know Esmeralda—who is much smaller than her mother, Dolores—here, and see some of my favorite baby pictures of her here.) 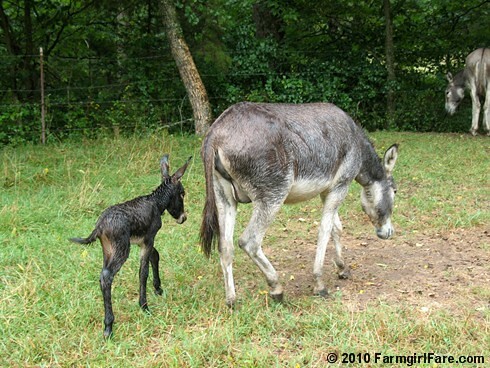 Congratulations also go out to proud Donkey Doodle Daddy who is also, ahem, Grandaddy. 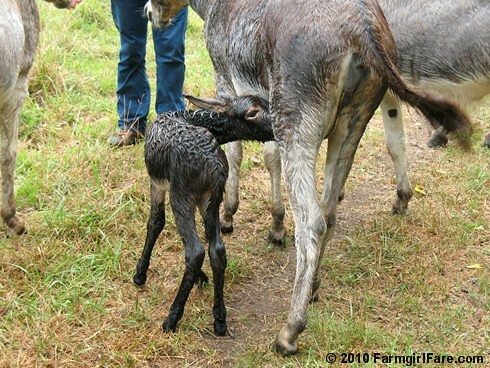 Just after our newest addition to the farm was born, an unexpected but extremely welcome thunderstorm blew in, giving us 3/4" of much needed rain—which is why everybody in these photos looks so soggy. At one point this morning, Joe jokingly (I think) said we should name him Gnat, since he's so small. (I tried to get a picture of the two baby boys together so you could see the huge size difference between them but couldn't.) At first I took offense, but I actually kinda like the name. Then I overheard him saying to the first little guy, "Now we can offically name you Gus, and she can give him one of those other names." I'm still not sure about Gus as a name for the first guy. I was sweet on Gino for a few days (thanks for the suggestion, Gigi! 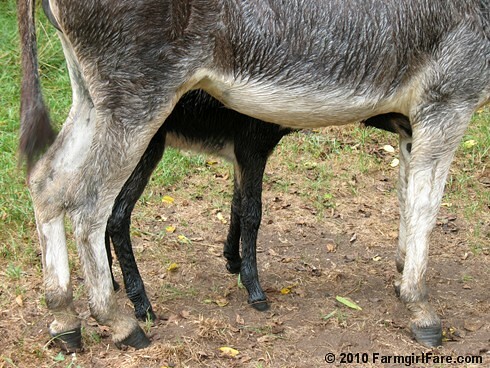 ), but today I realized (duh) that we need to be picking a name that will fit a grown up donkey, not the baby, which is what I'd been doing up to now. Of course then we're faced with the fact that we have no idea what these guys will actually look like when they're grown up. Ack. Maybe Gus would work. 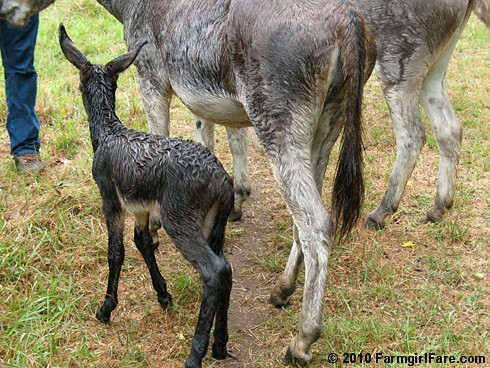 I realize I'm probably placing far too much importance on this whole donkey naming thing, but farm life involves hours of mindless work during which there is plenty of time to contemplate such things. Thank you so much for all the dozens of wonderful 'G' names you've suggested so far. I'm thrilled that now we get to choose two! Because if the first little guy gets to stay, shouldn't this one, too? Which means he also needs to get fixed when the vet comes to visit. 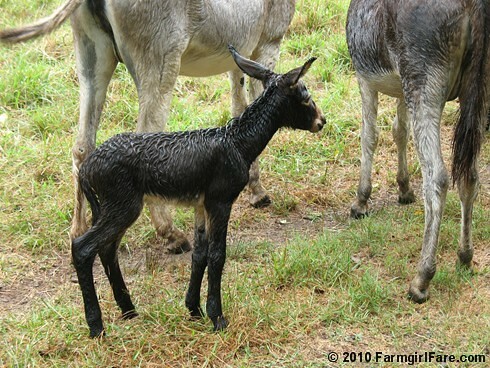 © FarmgirlFare.com, the growing—and totally unable to narrow it down to only six photos for this post as originally planned—foodie farm blog where we're hoping the vet might cut us a deal on Donkey Doodle Dandy and the two little guys all at once. Get it? (Fifteen years ago I never would have.) Sorry, couldn't resist a little bad farm humor. 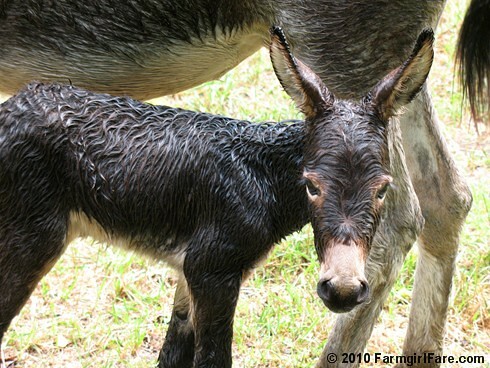 Awww, another cutie!! 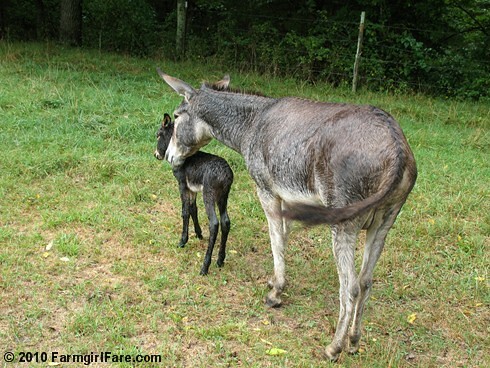 I just love baby animals! You very funny lady, hahah. See how we cut you a deal!!! 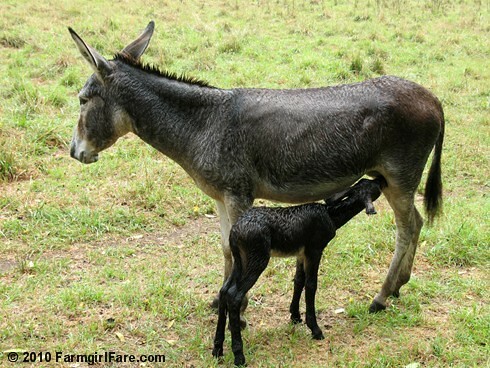 Well, at least fixed boy donkeys can't get pregnant no matter WHO jumps the fence, or hormonal "times of the month." See, you KNEW you wanted boys, right? Boy, oh, boy--he is CUTE! Great story...hoping you work out a deal with the vet! Thanks for so many photos! Sweet! Congrats to the whole family! He's a cutie whatever you name him. 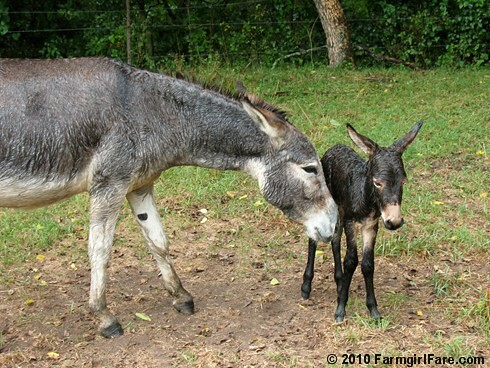 As I read what you say, Hunky FarmGuy has made up his mind about Gus so I think it's a done deal, don't you? He is so cute! I love how dark he is. He looks like a Gregory to me. 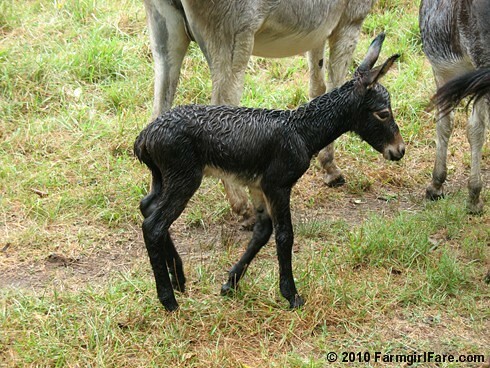 First congratulations on the birth of this little guy. Second, if you have him, Gus and Dan fixed who will be the next stud? Oh such cuteness! 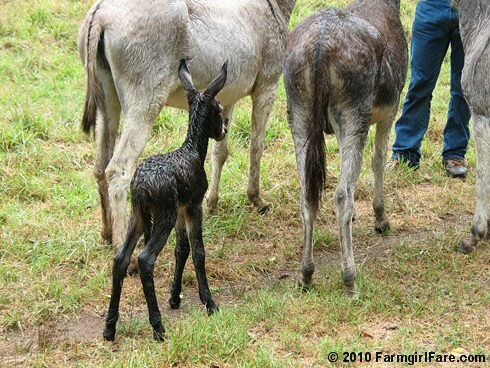 Double Dose of Donkey Doodle Daddy genes (ahem). Aw what a cutie! What about Galelio? Gabriel? or Garfield? I wish one of the boys could come stay on our farm. He could still be Gus. I like that name. 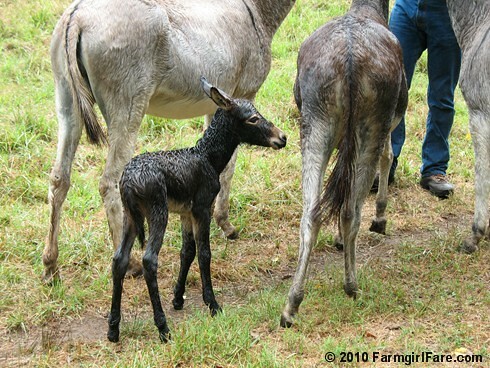 What a beautiful baby !! Are you sure he's all OK? He's awfully dinky. Of course you're sure, silly me. 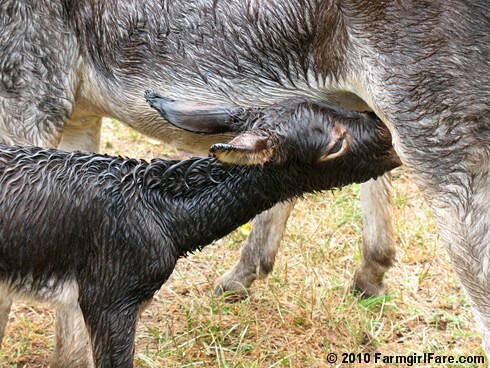 You are so very special, you have to be, God put all these beautiful babies and animals in your care. But please take care of yourself also.. I think the new little guy looks like a Gregor. 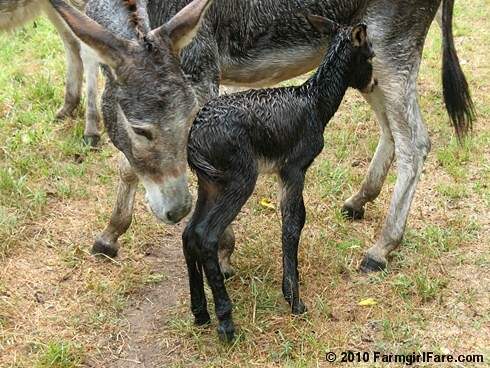 Looking at your various baby donkeys along with their parents puts me in mind of genetic inheritance patterns, with Dan having very different traits (small and dark) from Daphne and Dolores (large and pale). Esmeralda and Evie are the F1, and now you have a backcross! Size and coat color aren't strictly Mendelian traits, of course, but I still think it makes Gregor a doubly good name. Oh what a slender little fellow! He looks like a little fawn. He definately needs to stay! Hope the vet cuts you a deal, snip! 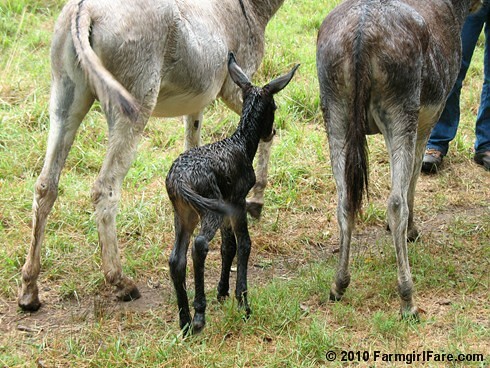 Congratulations on your beloved donkey family! Congrats on the new baby boy. Very cute! 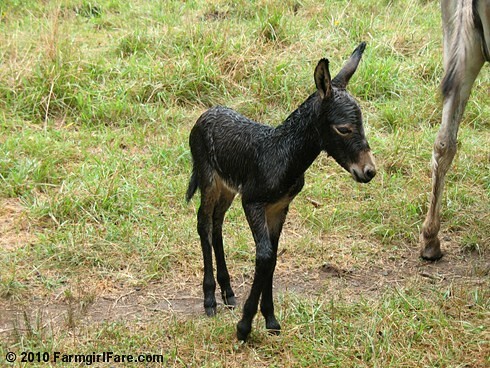 "Gino" would work for a grown up donkey. (I knew an older man named Gino long ago. )Gus is good too. George is a nice name.